Parsnips are one of my favorite root vegetables, and I often make sure to pick some up at the farmer’s market. What are parsnips? Although they belong to the carrot family, they are completely separate species. They are typically larger than carrots with a nuttier taste. Also, parsnip nutrition will differ from carrot nutrition. Parsnips are loaded with vitamin C, vitamin K, manganese, and folate. As a result, they boost eye health, improve digestive function, prevent birth defects, promote heart health, support bone health, and more. Read on to learn about the amazing parsnip, as well as its many health benefits and uses. I’ll also leave a couple of delicious parsnip recipes for you to try as well. Parsnips (Pastinaca sativa) are biennial plants that grow in their second year before dying afterward. They are members of the Apiaceae family, which also includes carrots, parsley, dill, caraway, and cumin. They are often planted before winter since that’s when it produces its sweet flavor. A mature parsnip plant can grow up to 1.5 meters tall, and it’s a favorite for gardeners that prefer crops with a short growing season. European settlers are suspected to have brought parsnips to North America in the 17th century. Ancient Romans and Greeks have also cultivated the parsnip for centuries; however, there is not much history about them since they were categorized as carrots. Parsnips look so much like carrots that it is easy to confuse them with each other. Parsnips have thick cream-colored skin, while carrots are typically bright orange. They are sometimes mistaken for parsley root, but there are differences. The parsnip root is sold alone, while parsley root is sold with the greens still attached. How are wild parsnips different than other parsnips? It is a poisonous parsnip with pretty yellow flowers that grows along roadsides. Avoid picking this parsnip because you could get severe contact dermatitis as a result. Wild parsnips are considered an invasive Eurasian weed with an edible root. But, its stems, leaves, and flowers contain a toxic sap that can produce severe burns. Wild parsnips will grow across North America. Parsnips are loaded with nutrients. 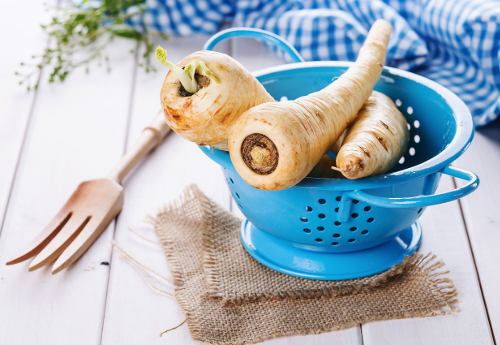 What makes parsnip nutrition so special? A half cup of cooked parsnip slices contains 13.3 grams of carbohydrates, 2.8 grams of fiber, and 1 gram of protein. From a micronutrient perspective, parsnips contain large amounts of vitamin C, vitamin K, folate, and manganese. Parsnips are also a good source of vitamins E, B1, B2, B3, B5, and B6, as well as calcium, iron, magnesium, phosphorus, potassium, zinc, copper, and selenium. The following is a comprehensive parsnip nutrition chart with information for a half cup of cooked parsnip slices or 78 grams of the vegetable. What are the health benefits of parsnips? The high soluble fiber in parsnips can help improve digestion and lower the risk of diabetes. Parsnips also contain key nutrients that improve eye health, promote heart health, support bone health, prevent birth defects, and more. The following is further detail about parsnip health benefits. Parsnips contain an impressive amount of vitamin C. As a result, parsnips benefit eye health, and specifically can help prevent against age-related macular degeneration. A study published in the journal Scientific Reports in 2016 found that people with age-related macular degeneration often have a lower intake of vitamin C.
Other research shows that vitamin C can help prevent age-related macular degeneration. This is where added lots of vitamin C-rich foods to the diet like parsnips can improve your eye health. There is a significant amount of fiber in parsnips. The fiber helps keep the digestive system moving, and allows for regular bowel movements. As a result, getting more parsnips in the diet can be a good way to relieve constipation and improve the digestive system overall. Parsnip nutrition contains several heart-healthy nutrients, including vitamin C, folate, and potassium. As a result, parsnips are a great vegetable for protecting against heart disease. The potassium in particular acts like a vasodilator, which helps prevent veins and arteries from tightening. So, it reduces stress and blood pressure on the heart. The folate in parsnips also decreases homocysteine levels in the blood, which is good news since high homocysteine levels have a link with heart disease. Manganese is a big part of parsnip nutrition. Manganese is also a co-factor of glycosyltransferases, which are enzymes needed for the healthy production of bone and cartilage. Interestingly, women with osteoporosis have been found to have lower manganese levels. Folate is another key nutrient found in parsnips. Research shows that a higher intake of folate is needed during pregnancy to reduce the likelihood of having children with birth defects, such as brain damage, spina bifida, and cleft palate. Women need extra folate before conception and throughout pregnancy, and parsnips offer a natural way to boost folate intake from the diet. Parsnips have ivory or pale yellow and creamy skin with a shape similar to a bulbous or top-heavy carrot. Choose parsnips that are dry, firm, and free of blemishes. For the best taste profile, the size should be small to medium. Parsnips can be found throughout the year in grocery stores, although they are in season during fall and spring. For storing, parsnips should be wrapped in paper towel, and placed in a container or sealed bag. Wash them when you are ready to use them. They store well in the refrigerator for about two weeks. Before using parsnips, you should peel them and cut off the bottom and top, just as you would prepare a carrot. Parsnips can be chopped any way you like after that. They can be eaten raw and grated into salads. There are various ways to cook parsnips. They are nuttier and sweeter when cooked. You can boil, bake, roast, or steam them. Once cooked you can mash them or puree them. Parsnips also go well with stews, casseroles, and soups. The following are a couple of quick parsnip recipes to help get you started in the kitchen with this delicious root vegetable. Preheat the oven to 425°F. In the meantime, chop the Jerusalem artichokes and parsnips into roughly quarter-inch sticks that are two to three inches long. Toss the chopped vegetables with the ghee or coconut oil, rosemary, thyme, and garlic. Spread the vegetables on a baking sheet, and roast for 30 to 40 minutes, or until fork-tender. Enjoy as a delicious side to any meal. Wash and cut the parsnips, carrots, and beets into cubes, and place into a large pot filled with water. Bring to a boil, and decrease heat to a simmer for 20 to 30 minutes, or until soft. Then drain. Place the ingredients in a blender, and puree until smoother. Then, transfer to Mason jars and let them cool. Then cover and store in the fridge. The recipe makes six cups and keeps for about six weeks in the refrigerator. This sauce is perfect for potatoes, pasta, or other foods where you may use ketchup. Parsnips are loaded with nutrition and contain especially high levels of vitamin C, vitamin K, manganese, and folate. As a result, parsnips can improve digestion, promote heart health, support bone health, boost eye health, prevent birth defects, and more. One word of caution with parsnips is it’s possible to be allergic to them. If you have a reaction after eating them, stop eating parsnips and contact your doctor for assistance. It is also important to be aware of wild parsnips which are found mostly in open areas like fields, pastures, and roadsides. They produce a sap with a chemical thought to cause the skin to react with sunlight and lead to intense rashes, burns, or blisters. Next time you are at the farmer’s market or grocery store, look for parsnips near the other root vegetables. They make a great addition to soups, stews, or even roasted, and you’ll be glad you have them on hand for your next meal. You are sure to enjoy them! “Parsnips, cooked, boiled, drained, without salt,” SELF NutritionData; http://nutritiondata.self.com/facts/vegetables-and-vegetable-products/2515/2, last accessed June 7, 2017. “5 Incredible Benefits of Parsnips,” Organic Facts; https://www.organicfacts.net/health-benefits/vegetable/parsnips.html, last accessed June 7, 2017. “Parsnip: The ‘Carrot Alternative’ You’ve Probably Never Heard Of,” Mercola Food Facts; http://foodfacts.mercola.com/parsnip.html, last accessed June 7, 2017. Thompson, C., “5 Fun Facts About Parsnips,” WebMD, August 15, 2014; http://www.webmd.com/diet/features/5-fun-facts-about-parsnips, last assessed June 7, 2017. Aoki, A., et al., “Dietary n-3 Fatty Acid, alpha-tocopherol, zinc, vitamin D, vitamin C, and beta-carotene are Associated with Age-Related Macular Degeneration in Japan,” Scientific Reports, February 5, 2016; 6:20723, doi: 10.1038/srep20723. Sanfilippo, D., Practical Paleo: A Customized Approach to Health and a Whole Foods Lifestyle (USA: Victory Belt Publishing Inc., 2012), 350. Daniluk, J., “Hot Detox: A 21-Day Anti-Inflammatory Program to Heal Your Gut and Cleanse Your Body (Toronto: HarperCollins Publishers Ltd., 2016), 258.